The first sign of mobility problems for seniors is usually a loss of balance or stability while walking. This often shows up as seniors holding onto furniture or walls while walking through the house. Walking aids like canes are really helpful for this group of elderly people by providing the support and balance they need. But, not all canes are made the same. So, what is the best walking cane for stability and balance? Read on for different options, features to look for, and my recommendations. In a hurry? Click here to jump right to my recommendations or keep on reading to learn how to choose a stable cane for yourself or a loved one. Many people think a cane is just a cane and there’s not much more to it. But there are many more types of walking canes than most people realize. If you want to learn more details about each type, check out this post. Standard canes are the most common type of cane you will see elderly people using out and around town. They basically consist of an adjustable shaft with a handle on the top and a single tip that makes contact with the ground. Because the cane tip touches the ground at only one single point, it must bear all the weight and balance of the user. Considering this, the user must have better balance themselves to use this type of cane. They are unable to rely on the cane to help balance them out and add stability. This is the type of thing you see with walking sticks too. Four pronged quad canes, however, have a wider base at the bottom. Attached to the base of these types of canes are 4 legs with rubber feet that all make contact with the ground. This means that the weight and balance of the user are spread out across multiple points and also across a wider base. A wider base 4 pronged cane like this helps add to the balance and stability of the user. This difference in the width of the base and number of support points with the ground is why 4 legged canes are the best canes for stability and balance. The wider base and multiple points of contact mean the cane is in contact with the ground longer throughout the stride. It’s the difference between standing on one leg or two – it is easier to hold your balance with both feet (and all four prongs) on the ground. As with any piece of medical equipment, it is important to know the advantages and disadvantages so that you can make a good decision. The wider base at the bottom offers several other advantages in addition to improving mobility or helping with balance and stability problems. First, the wider base allows the cane to stand up on its own. This is helpful because when the senior sits down, they can simply stand the cane up right next to the chair, rather than trying to find a surface to lean it against. That way, it is ready to go when they are. Also, the wider base reduces the chance of it being dropped while walking. It is more likely to keep standing on its own when compared to a standard cane. The bases are typically available in two different sizes: small and large. The sizes are also referred to as wide and narrow bases as well. Which is best? That depends on the level of support the senior needs. Large bases tend to be used more with men because they have larger strides and the cane needs to offer more support. Women who use canes tend to prefer the smaller base version because they take smaller steps, tend to prefer smaller framed equipment, and they typically weigh less than men, so they don’t need the cane to support as much weight as men do. The few drawbacks to a cane with four feet aren’t a big deal but should still be understood. First, style choices are going to be limited for people who want a highly fashionable cane. They also are a bit heavier than a standard cane because of the wider base and 4 prongs on the cane. CAUTION: It is important to know that some quad canes are handed. This means they are suited for use in either the right hand or the left hand only. Why would it matter? Because the base is narrower on the side nearest to the user. The purpose here is to reduce the chance of the cane hitting the user’s feet and causing them to trip or even fall. My recommended quad canes work with both right and left-handed seniors. But, I wanted you to know that in case you shop elsewhere. Here is a great video showing you how to fit a quad cane, the best way to walk with one and also how to adjust it for use on the right side or the left side of the body. Now that you understand why a cane with 4 feet is the best cane for balance problems, here are the ones I recommend. A great choice for a basic quad cane with adjustments that should work for most seniors. This is the best cane for people who travel. It is very lightweight and even folds in half so that it can be packed and stored. I really like this cane for seniors who need maximum stability and balance. It has a large base and built to be a little more durable. A popular cane among seniors that you may have even seen on TV. Not technically a quad cane but functions very similarly with a pivoting head. Images, Ratings, & Prices from Amazon Product Advertising API - Updated on 2019-04-20 at 03:05 - contains affiliate links (see footer). This is my favorite four pronged cane for people looking for a basic, “does the job” type of quad cane. Everything about it simple to set up and simple to use. This quad cane can be used in the right or left hand by spinning the base to the proper side. You want the narrower side closest to the user’s body. It’s also safe to use on virtually any surface, indoors or out, with the high traction design on its feet. Each prong is capped with a rubber tip that won’t mark up any surfaces but will give you added stability and security. The grip on the handle of this cane is also very comfortable and secure, but I particularly like it because it comes with an added wrist strap for extra stability. I also like this product because it’s very lightweight – less than 2 pounds – even though it’s made out of heavy-duty anodized aluminum. This makes it corrosion resistant, weatherproof, and durable while staying lightweight enough for everyday use. This four legged cane has an adjustable height feature that can fit a wide range of seniors. It can go from 28 to 37 inches, but can support up to 300 pounds. It comes in five colors (blue, black, brown, red, and purple) too, which is a nice touch. 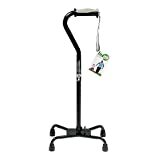 For seniors with tight spaces or who travel a lot, this folding quad cane from Ez2Care is a big help. It folds up quickly and even fits into suitcases and travel bags. It offers the stability and balance of other 4 legged canes, but this base is a little beefier than others. The base can be used with right or left handed seniors by pressing the knob and rotating the shaft. The handle is also very comfortable and contours to your hand while providing a secure grip. It also has that great adjustable height feature to accommodate any sized senior, adjusting from 29 to 37 inches. It can support about 250 pounds, but it only weighs about 1 pound, further contributing to the portability factor. This four pronged cane also comes with a strap for easy carrying when it’s not in use. However, it’s only available in one black/gray color. Effortless switching to fit either hands. Simply press the knob release and switch direction. Conveniently folded for carrying and storage. Dual side snap design allows the cane to fit comfortably on either the left or the right side. Adjustable Height from 29" to 37"
For seniors who need maximum stability and balance, consider a wide base four pronged cane like this one. The longer, wider base has even more surface area to support the user. 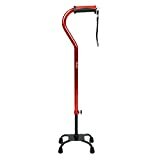 Like my other recommended walking canes, the base can be rotated to fit right or left handed users with a K shaped base. Simply loosen the adjustment knob and spin the base until the narrower side is toward the body. I also really like this cane because of its shock absorbing cushioned handle. This is great for walking on any kind of terrain and avoiding any hand pain. There’s also a reflective strap to add some safety and security when walking at night. This cane is a little heavier than my other choices, coming in at 2.7 pounds. It’s body is made out of heavy-gauge anodized aluminum, which is great for durability purposes. But, this may be an issue for a senior who would prefer something a little easier to handle. 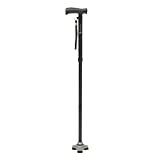 This 4 legged cane has an adjustable height feature that can fit seniors ranging from 5’0″ to 6’5″. To adjust, you can simply push the button to set the cane to any of its 11 height settings. No matter what height you choose, the cane can support up to 300 pounds. It comes in black, cocoa, and rose colors. Images, Ratings, & Prices from Amazon Product Advertising API - Updated on 2019-04-20 at 02:46 - contains affiliate links (see footer). 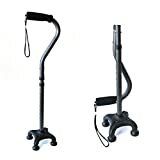 Finally, the HurryCane is one of the most popular choices for seniors looking for stable canes. Even though it only has 3 prongs, it still provides an incredible amount of traction and balance both indoors and outdoors. What makes this cane unique is that the staff of the cane pivots around the bottom base, adding mobility and security simultaneously. The HurryCane’s other claim to fame is its quick folding function. It can go from full size to completely compact in seconds, which is very handy for seniors on the move. You can adjust this cane from 30.5 inches to 37.5 inches, and it has a weight capacity of about 350 pounds. It has a very comfortable ergonomic handle as a plus. The HurryCane comes in 4 colors – red, purple, black, and blue. Images, Ratings, & Prices from Amazon Product Advertising API - Updated on 2019-04-20 at 02:25 - contains affiliate links (see footer). If you already have a cane that you love, but you want the added stability of a 4 legged cane, you still have options. Many manufacturers make add-on bases that stick on to existing staffs and add security to any cane. 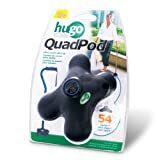 This one from Hugo fits most aluminum canes with a 3/4 inch tubing diameter. It’s made out of rubber, which is a material that provides great traction on most surfaces, and also helps absorb the shock of any impact while walking. This add-on cane tip is actually 54% lighter, and 80% more compact than a typical cane with 4 legs. This feature means it won’t add too much weight to your existing cane, and it’ll still be able to help you through narrow passageways and up staircases. Despite being very lightweight, it has a weight capacity of 300 pounds, so it can support nearly any sized senior. The cane accessory also has a unique design that allows it to recenter itself for stability, which also lets it stand on its own when it’s not in use. Images, Ratings, & Prices from Amazon Product Advertising API - Updated on 2019-04-20 at 01:26 - contains affiliate links (see footer). A quad cane with 4 prongs on the bottom is usually recommended as the best walking cane for balance an stability. The larger base offers more support by maintaining contact with the ground better. They are truly helpful to seniors with minor balance issues. They are very inexpensive and people either buy them outright or they are also covered by Medicare. However, if the senior seems unsteady only using one hand for balance, a walker, a rollator with seat or even a wheelchair should be considered. The goal here is for improved safety for seniors and elderly. Reducing the chance of a fall is an important part of this. Do you have any experience picking out a quad cane for you or a loved one? Which one do you recommend? Feel free to share in the comments below. Questions are always welcome too!